There are few bowhunters ever to pull back an arrow as accomplished as Tom Miranda, and there are far fewer that have penned a classic book like Tom's new "Adventure Bowhunter. " The book is part biographical, part reference, and part entertaining with hundreds of quality photos of animals (both living and dead). While this book is primarily about Tom's pursuit of the North American 29, in Tom's classy fashion he pays tribute to many bowhunters in this book including a lot of the names you know right here from Bowsite. The book is hardbound and quite large; almost 400 pages with thick stock paper and 450 color photos and illustrations that jump off the page. I can't imagine what it cost to publish a book of this size and quality, but obviously Tom was more concerned with the finished product than profits and spared no expense. This is NOT your typical hunting book. 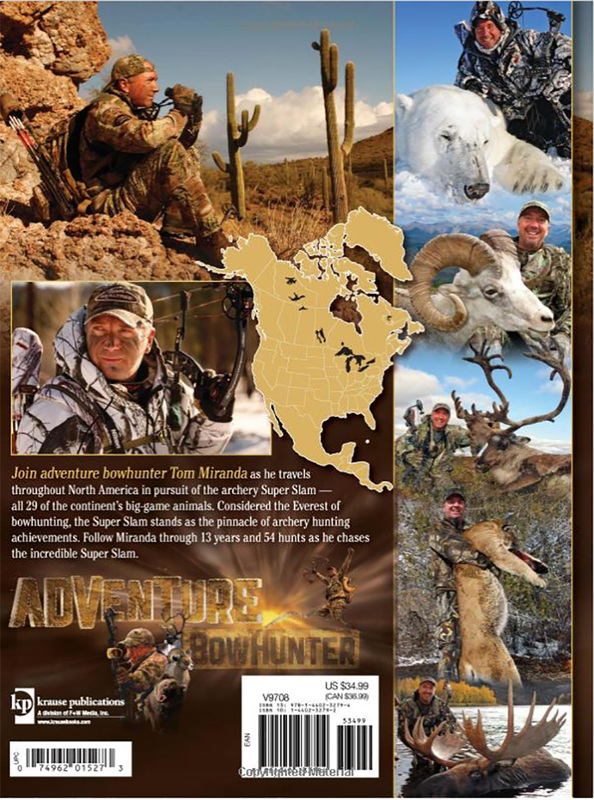 Check out Tom Miranda's new Book Adventure Bowhunter. 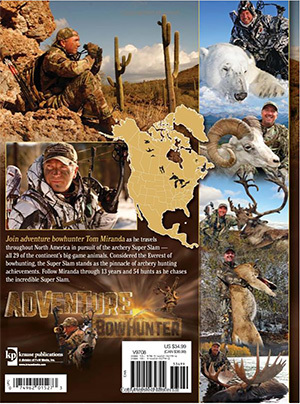 This book chronicles Tom's 13 year quest for the Archery Super Slam of North American Big Game. 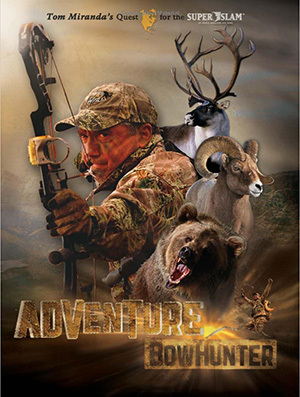 368 pages with over 450 color photos and illustrations Adventure Bowhunter is the definitive book completely devoted to bowhunting North America's 29 big game animals. Professionally published this "coffee table" hardcover includes gold embossed cover and stylish dust jacket. With Forward by Jim Shockey and Introduction by Bill Jordan. It's the perfect companion to Tom's Adventure Bowhunter DVD. For serious trophy hunters this book is - without any doubt - a must have. 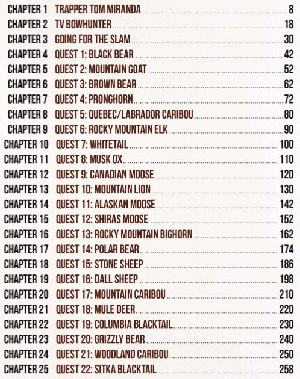 It contains reference on every animal contained within the North American 29 and chronicles not only Tom's pursuit of each, but the outfitters he used, the gear, the costs involved in the hunt, and a ton of data useful for any big game Bowhunter dreaming beyond the back forty. If you hunt just one of these species, this book's price tag ($29.95) will pay for itself just from the tips and equipment essentials Tom includes with each species. 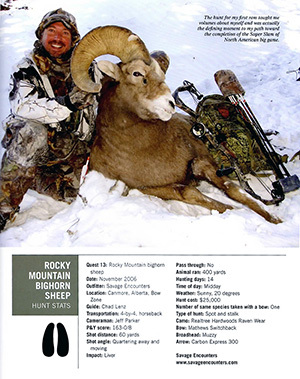 It is the best reference I have seen for big game bowhunters ever produced. As you can probably tell, I like data and reference books. I like to read about tactics, equipment, and tips for the animals I am hunting. This book has tons of reference and data. But it also contains stories from each one of Tom's hunts as he pursued his NA29. These stories are well-written and realistically lay out the trials and hardships Tom endured in his pursuit. My favorite was The Desert Bighorn story which took four tries to accomplish and was the last animal needed to complete his quest. The emotions are clearly and wonderfully articulated. So send your wife this link and tell her to put this book on your Christmas list. You won't regret it!